The luck of the Irish stems from the four leaf clover. Four leaf clovers are rare and hard to find, thus it is said to be good luck to find one. 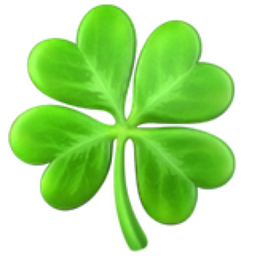 A popular emoji to use on St. Patrick's Day. A nice looking green four leaf clover. Again, almost three-dee ish.